The Ventura County Civic Alliance has been working on a "Compact for a Sustainable Ventura County." 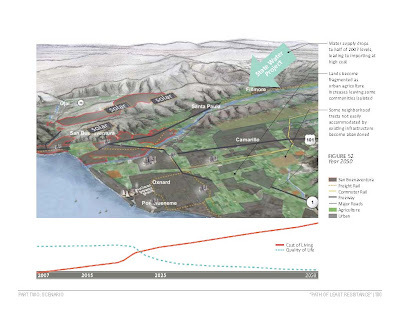 Their website includes a document titled 'Post Peak Oil Vision Plan for Ventura,' a project spearheaded by city councilman Brian Brennan and written by a team from the Department of Landscape Architecture at California State Polytechnic University, Pomona. The following is a condensed review of the action plan outlined in the 275 page publication. It outlines a strategy for action, both for Policy Makers and the Community, and includes intermediate goals for 2015, 2025, and 2050. The peak in global oil production, or Peak Oil, will necessitate a change in the way communities function. The Post-Peak Oil Vision Plan analyzes probable implications of Peak Oil on the City of San Buenaventura and the surrounding region, and describes a vision for post-Peak Oil planning that responds to these implications by building upon positive trends that are already taking place. The regional vision emphasizes preservation of natural resources, concentration of the developed footprint, and intra-regional collaboration. The 2050 vision for the City of San Buenaventura demonstrates the potential for transformation of urban environments. Under this vision, 85 percent of the population lives on less than a third of the city’s land and is within walking distance of daily needs; 50 percent of the food supply is grown within city limits; and greywater and roofwater supply over 75 percent of urban irrigation needs. The community design that results from this plan includes a significant reduction in energy demand and an increase in quality of life. • Act Now. Begin research, experiments, and education programs that will facilitate the post-Peak Oil shift in society and its critical support systems. • Adapt. Transition existing infrastructure, land use, and lifestyles in order to meet the needs of future generations. • Collaborate. Connect governing bodies and citizen groups throughout the region in order to protect the wealth of resources, including water, agricultural land, transportation systems, and human resources in order to thrive and prosper post-Peak Oil. Last year saw a potential success story on the Ventura River as steelhead took advantage of a wet winter to migrate upstream through the new fish ladder at the Robles Diversion. And this year's monitoring shows a good juvenile population. But although the water district goes through the motions, a majority of the board still believes that the water in the river is theirs for the taking. On Sept 25, 2008, a federal appeals court ruled in favor of Casitas Water District on the Ventura River, California. 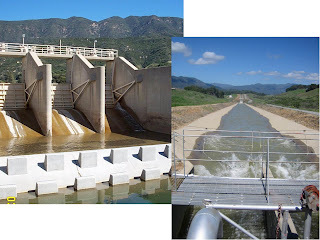 According to their lawyer, Casitas is potentially entitled to $80 million for the "loss of water" due to operations of a recently constructed fish ladder at Robles Diversion dam, located downstream of the obsolete Matilija Dam which is slated for removal in 2014. But first the District must show that they 'own' the water in the river, a public trust asset... The ultimate outcome will affect future water management policy throughout the West. Last year local beach users documented extreme impacts from new agriculture on Taylor Ranch, above the beach at Emma Wood State Beach. Irrigation of the new plantings resulted in runoff from the impervious plastic sheeting commonly used with industrial strawberries. This year we are seeing a repeat. Here's a photo of the Ventura River taken from the Main St Bridge on Friday Oct 17. 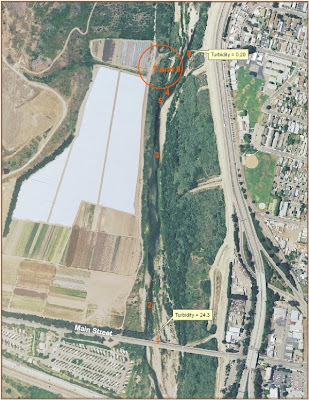 Surfers and concerned citizens have been expressing alarm about unusually muddy water flowing down the lower Ventura River into the ocean, and Stream Team volunteers have been working to identify the source. Over the last two months, we've recorded unusually high turbidity (water clarity) at our sampling site under the Main Street bridge, including the highest dry weather turbidity measurement we've had in eight years of sampling. Upstream measurements at our sampling site near Stanley drain have been normal, indicating that the source of turbidity is somewhere in between these two sites. The biggest recent change to adjacent land use has been the expansion of agricultural operations along the western bank of the lower river. Recently, a small crew of dedicated Stream Team vo lunteers helped us investigate the lower river, and found that the river bed is choked with fine sediment. A small drainage ditch has been cut into the western stream bank by irrigation runoff from adjacent agricultural operations. This ditch carries so much sediment into the river, estuary, and ocean that it has significantly increased turbidity. Of additional concern is the potential for agricultural pesticides and fertilizers to contaminate downstream waters. Agricultural operations are regulated by the State's Porter Cologne Water Quality Control Act under the Conditional Waiver of Waste Discharge Requirements for Discharges from Irrigated Lands. They are required to have in place a water quality monitoring program, a Water Quality Management Plan, and Best Management Practices (BMPs) that ensure they are not significantly impacting downstream water quality. Channelkeeper has written a letter to the Los Angeles Regional Water Quality Control Board requesting they inspect adjacent agricultural operations to ensure that these measures are being implemented, and our volunteers have approached the City of Ventura with these same concerns. City staff have already contacted the facility to discuss irrigation runoff issues and future BMP improvements. Channelkeeper and Stream Team will continue to monitor conditions along the lower river. The working group met to discuss a proposed phasing plan for construction of the Surfers' Point project. 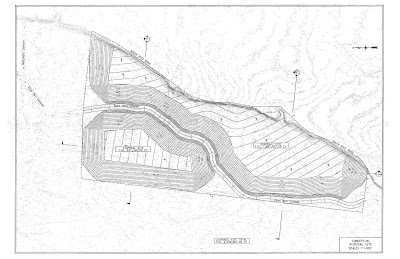 The "Managed Shoreline Retreat Project" calls for relocation of the coastal bike path and parking lot and construction of a cobble berm to protect the shoreline. Sand dunes will be constructed and vegetated on top of the cobble. 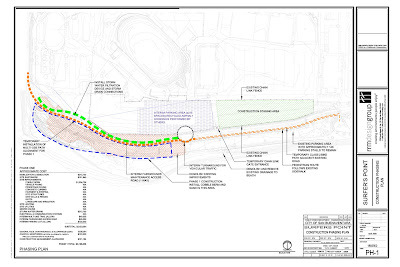 According to the draft plan presented, this first phase of construction would remove the upper (western) portion of the damaged parking lot and construct the cobble berm, re-route the bike path and interim fairgrounds maintenance road, install stormwater clarifier, and maintain current parking and beach access. Sand dune restoration is not included in this plan, although several working group members felt it would be beneficial to try to complete this portion of the project. As this represents about 6 months of construction work, it would make sense to phase the project in this manner even if all the money was available - the conditions imposed with the Coastal Commission permit require construction after labor day and before memorial day to avoid the summer beach season and the Ventura County Fair. The primary focus of this meeting was the Potential Slurry Disposal Area(s). Other features and related issues will be tabled for future DOG meetings. The meeting was well attended, and included several local residents, water district representatives, and other local stakeholders. It is interesting to note that this has now elevated itself to an election campaign issue: "candidates running for two board seats in the Meiners Oaks County Water District...oppose a proposed dumping site for sludge to be removed from behind Matilija Dam. The site is near two of the district's best producing wells." Ventura County engineer Peter Sheydey provided an introduction, stating that the reason for the slurry is to protect CMWD water diversions. 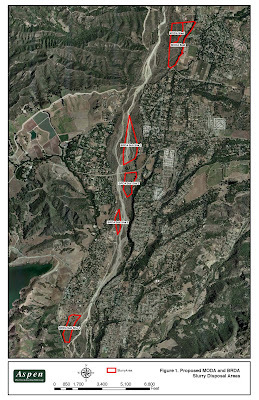 As part of the Matilija Dam removal plan, approximately 2 million cubic yards of fine silt and clay will be dredged and slurried downstream of the Robles Diversion to prevent the suspended sediments from entering Lake Casitas. The purpose of this meeting was to solicit comments and suggestions for selection/evaluation criteria. • Alternate channel straight to river, would discharge near existing bedrock pools. ASPEN environmental consultants provided a summary of their Biological Information Studies. 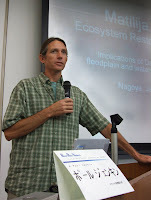 The second Case study considered in this year's River Policy Network symposium in Japan was the Akaya Project. 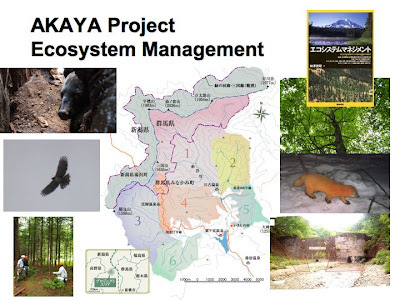 The “Akaya Project” is a collaborative project organized by local residents, the Regional office of the national Forestry Agency, and the Nature Conservation Society of Japan. These groups entered into an agreement in order to formalize their collaborative efforts to achieve a sustainable community as well as restoring biodiversity in the adjoining national forests. Officially called the “Biodiversity Restoration Program for Mikuni Mountains and Akaya River,” it is also dubbed the “Akaya Project” because this program covers the tributaries of Tone River and the upper river basin of Akaya River. The project includes a variety of conservation and restoration components, and includes volunteer and educational opportunities for the public. Their newsletters contain beautiful artwork depicting the local flora and fauna. Making good use of donated buildings, their small headquarters includes rustic sleeping accommodations for work parties and visiting school groups. Some of the Akaya restoration work includes propogating and planting native trees to replace non-native forests, a root cause of much of the ecological disturbance in the planning area. 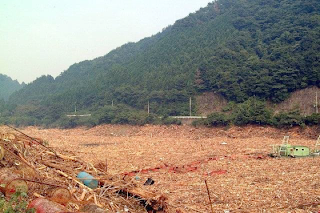 Forestry practices in Japan include the construction of debris dams, or “sabo dams,” intended to capture sediment eroding from clearcut logging areas. Any visitor to Japan will notice the proliferation of these concrete structures throughout the countryside, even in remote areas where direct property damage is not an issue. This is a byproduct of a huge, and often mis-guided, domestic infrastructure budget. 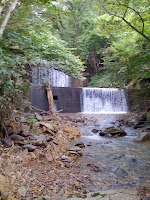 One component of the Akaya Project is the removal of soil saving dams at Mogurazawa, a tributary of Akaya river. 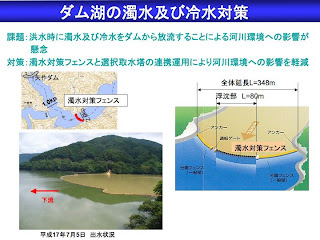 This is probably the first case in which soil saving dams will be removed within national forests, and it is hoped that this will become a new model for forestry management operations in Japan. Our group hiked through the forest and up the small tributary creek to see firsthand the dam in question. In this case, recent structural damage had undermined the foundation. We crawled through the slot under the dam to see that most of the accumulated sediment had been naturally flushed under the dam. The plan is to remove the central portion of the structure, leaving ‘wings’ on either side. I understood this is intended to help stabilize the streambanks while passing sediment downstream. At one point I was asked if I had any ideas for ‘ecotourism’ development in the area. The hotspring resorts already draw Japanese tourists, but there are other users of the hotsprings in the winter. 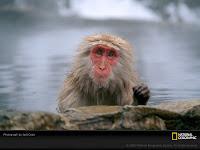 Having seen a National Geographic magazine several years ago, I was interested to hear that "Japanese snow monkeys" visit Akaya's natural hotsprings in the winter. Although the Japanese seem accustomed to monkeys, I suggested that monkeys enjoying a hot bath could be a big draw for foreign tourists. 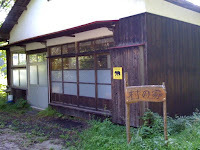 Location: the northern area of Niiharu, Minakami-Cyo(former Niiharu Village), Gunma Pref. The focus of the program was management of aging dams, and included two symposiums (Osaka and Nagoya) and two field trips. Japan has many dams, large and small, which are experiencing typical sedimentation, structural aging, and environmental impacts. 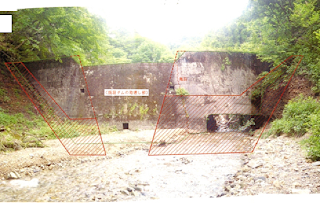 The case of Matilija Dam was presented alongside Yahagi Dam and the Akaya Project in Japan. Other presenters elaborated on the impacts of sedimentation on Japan's reservoirs and other environmental effects. Yahagi Dam is the main dam of several on the Yahagi River, which drains into the bay near Nagoya, Japan. Nagoya is one of the industrial centers of Japan, home to Toyota's global headquarters and several manufacturing plants. The dam operators cite that Yahagi Dam provides over 1.3 million kWh of hydroelectricity, enough to power all of Toyota's manufacturing in the area. Construction of the 100m high dam was completed in 1971 at a cost of 14.5 billion yen (around $145 million.) Sedimentation has occurred faster than predicted, and today the reservoir is 40% filled with over 15 million cubic meters of sand. This has reduced the length of the reservoir from 8km to 4km, reduced flood control capacity, impacted water quality, and degraded downstream fish habitat for a historic and existing commercial fishery, as well as posed a threat to future energy generation capacity. In an effort to offset the loss of reservoir capacity, Yahagi Dam managers have been dredging the reservoir and trucking sand downstream. 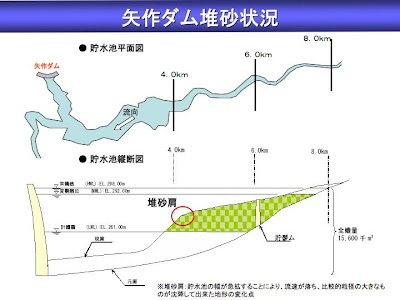 In one project, 60,000cu.m was transported by truck 96km to the bay, where the new land formed by the sediment deposit was turned into a park. This was very expensive, costing approximately $100/cu.m. Another project trucked sand to a location within the floodplain downstream, where it eroded away during a flood helping to restore river habitat. A project is also underway to truck sand to the bay in an attempt to revive a commercial clam fishery that has been lost due to the shortage of sand in the system. The more permanent solution being considered is a tunnel that will bypass sand from the upstream reservoir delta to the river downstream. The tunnel would be almost 9km long, and would require careful engineering to provide adequate sediment transport at the right time. 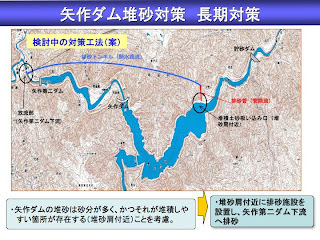 Perhaps most significant about the Yahagi River is that it has become a case study of citizen-based action to protect local resources and partially mitigate the impacts of dams. Beginning in 1969, local fisheries and farming cooperatives organized to solve water quality issues in the watershed. The Yahagi River Basin Water Quality Preservation Association (YWPA) includes agrarian, fishery and local municipalities. In recent years, local fishermen have been instrumental in working with dam managers to improve downstream flows, water quality, and sediment management for downstream fisheries. This is a significant first in a country where complete de-watering of rivers downstream of major dams is common. (Water is often diverted through elaborate hyroelectric and transbasin schemes.) It was a privilege to meet two of the leaders of the Yahagi River Fishery Cooperative. In addition to environmental flows, dam managers, working with the local fishermen, developed a silt 'curtain' to eliminate high turbidity water from the intake structure. This has been effective in preventing fine silt from smothering downstream spawning gravels, resulting in increased fish populations. 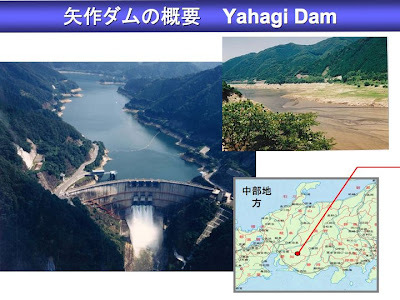 The most dramatic problem at Yahagi Dam is the influx of millions of trees during a large flood event. 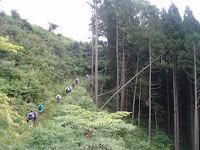 This is in large part due to forestry practices in Japan after WWII, and the resulting instability of the steep mountain slopes from the non-native timber. The solution in this case was to start a charcoal production business, creating an economic means to clear the reservoir. Here the tour group is pictured at the charcoal kilns upstream of Yahagi Dam.